Eduardo Alejandro was born in Mexico City. At 5 years of age his parents divorce and he is taken to the city of Colima, where his grandparents receive him as his own son. Since childhood, Eduardo Alejandro had the desire to succeed, to leave poverty and the need for many things. In Colima, at 6 years old, she wore shoes at the market where her grandparents worked; He would sing in the trucks while still attending school. At age 15, he leaves the state of Colima following the advice of his grandmother, who was a great force and support in the vision of Eduardo Alejandro, undertaking the adventure of traveling to the United States; He arrives in search of a better future and success. Some guys receive it. Used and abused by the people where he comes to live, he is forced to work for them 18 hours a day, 7 days a week and, he has no alternative, to escape from that situation. With nowhere to go and without money, Eduardo starts looking for a job wherever he is, working on everything, including factories, cleaning companies in buildings, cleaning houses, etc. He usually had two jobs, including parking at night. He had the opportunity to work in the maintenance of a building and Eduardo learned industrial mechanics, electricity, maintenance of industrial systems of air conditioning and heating, and without stopping studying English, Eduardo Alejandro began to break through in the United States. Eduardo Alejandro knows what our Hispanic people have to do to survive as undocumented immigrants in the United States. He lived in the flesh the discrimination, exploitation, abuse and obstacles that the Hispanic faces with their families to leave Mariachi. go ahead due to the lack of support, education and motivation. Eduardo Alejandro is involved in the world of sales where he stands out for his ingenuity and command of the language, being one of the few employees who spoke English and Spanish. In this way he began to realize the abuses committed towards Hispanics; Many of those abuses involved fraud or deceive our humble people. By starting to produce hundreds of thousands of dollars per year for these companies, using his intuition, knowledge and unique sales plan, Eduardo Alejandro becomes an entrepreneur, creating several companies, including the powerful and well-known Advertising Group “Grupo Legal del Sur de California Inc. “Focusing on Advertising, Image Creation for Lawyers, Commercial Radio and TV, Production, Book Publications and Private Consulting for Businesses and Companies. Continuing with his business success, Eduardo A George, as he is known in the Los Angeles, California area, invests in his education, while continuing to sing in restaurants, karaokes becomes a member of prestigious private clubs, creating friendships, relationships, receiving mentoring in success for millionaire and successful people. Eduardo George (Eduardo Alejandro) is a successful entrepreneur, he is a great speaker and platform motivator, lecturer and author of the book “Secrets to Attract, Create and Retain New Customers for Life”, that when published, more than 1 million and a half of people visited their website. Making your book the most read in Spain. Receiving an invitation to be interviewed by Amazon Kindle Espana. Eduardo A George is an expert in marketing and communications in the Hispanic market, creating his own commercials in Radio, Television, and becoming a spokesman for lawyers, promoting law firms, designing his image and advertising campaigns. Eduardo A George has produced thousands of commercials and infomercials, including commercials “En Vivo” throughout the American Union for the past 20 years with his Advertising Group for Radio and Television that have successfully aired on Univision, Telemundo, Liberman Broadcasting, SBS , Entravision, Radio Centro among others. Eduardo George decided to create the book “Secrets to Attract, Create and Retain New Customers for Life” to make a difference and create values for the Hispanic community, which continues to suffer from the lack of education, guidance and motivation to succeed. “Secrets to Attract, Create and Retain New Customers for Life” potential helps all the person who wanted to start a business, the person who owns a small or large business that wanted to improve it. In chapter 8 of his book, Eduardo A. George tells how he survived cancer miraculously and using that reason as a catapult that led him to achieve success in the United States. During all those years, Eduardo A George never forgot his dream of being a singer and based on hard work, learning and strategies, he begins to prepare to be able to sing to the world becoming Eduardo Alejandro: “The Interpreter”. It is that love and passion that led Eduardo Alejandro to become today the singer who has the power to motivate and create massive values for the Hispanic community with his music, not only promoting love, but also success with his knowledge and experience in life. 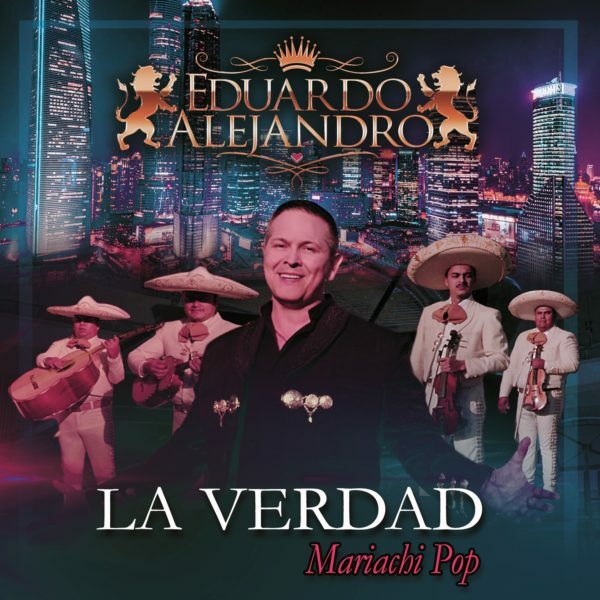 Today he presents his second album of 11 Songs Titled “LA TRUTH”; in the Mariachi Pop version, subject of her own inspiration, with arrangements and production by the maestro Toby Sandoval, who has collaborated with international artists such as Paulina Rubio, Laura Pausini, Emmanuel, Alejandra Guzman; located at the top of the world ranking in the genre, as one of the best producers and composers in BMI, Billboard and Latino Monitor. This album is accompanied by his video clip that is presented as a scoop in his “Press Tour” in countries such as Argentina, Chile, Central America, Mexico and for the first time in the United States in cities such as Los Angeles California and Miami. Capitol Records in Hollywood, California. Eduardo Alejandro, with this production will cover of romanticism and nostalgia the radio waves of all the territories of Spanish speech. 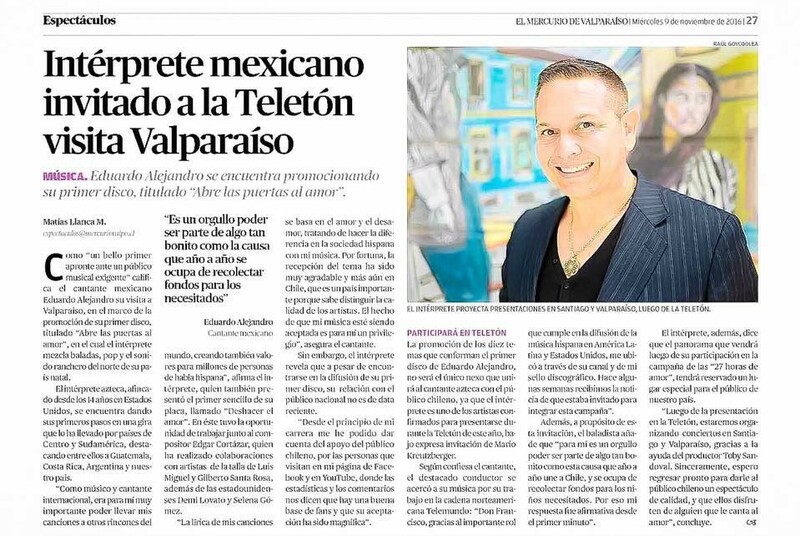 Currently, with a great team, Eduardo Alejandro promotes his material in several countries such as Chile, Argentina, Costa Rica, El Salvador, Guatemala, Mexico and now for the first time in the United States, winning the hearts of several million people. which wanted romantic songs with great quality and sincere vibration of love. It began with a successful promotional tour in several countries of Central and South America, where their music is already among the first places of popularity: Guatemala, El Salvador (First place of popularity in Metapa, San Miguel and the Capital San Salvador), Costa Rica. 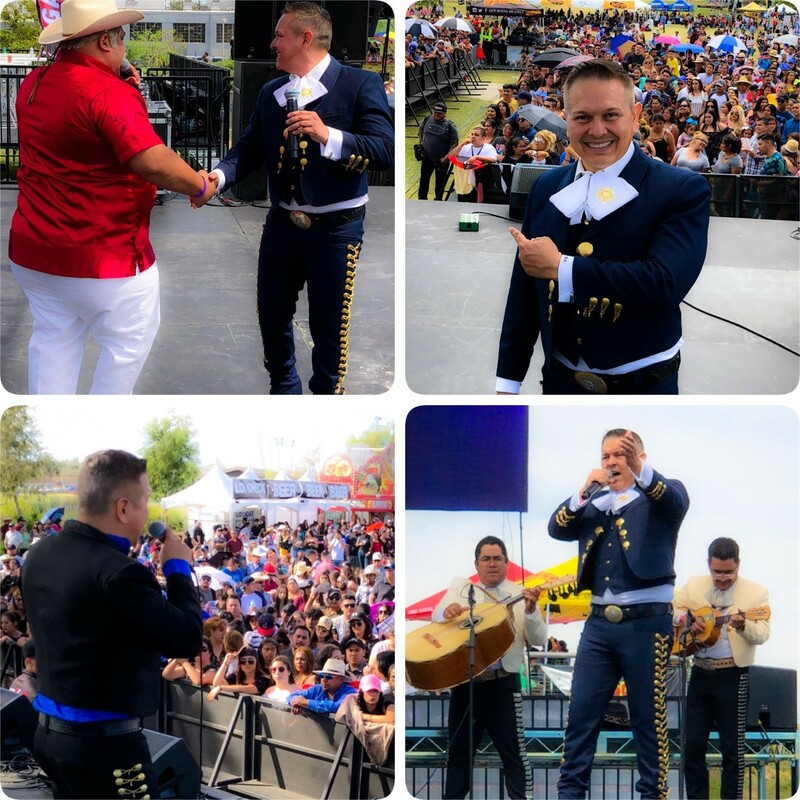 Recently he was in Argentina and Chile; and in the city of New York he received an award as Artist Revelation of the year in the genre Ranchero / Mariachi, within the framework of the Third International Mariachi Festival. some of the main cities of the United States such as Miami, New York, Chicago and Los Angeles. 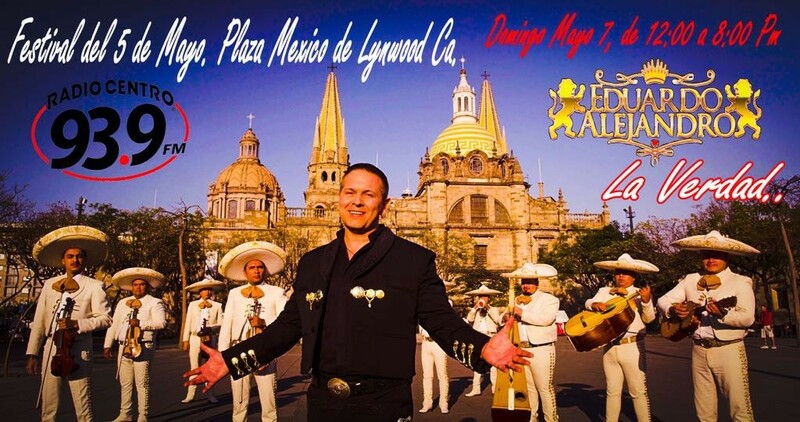 During last May of 2017, EDUARDO ALEJANDRO participated in the Festival May 5, of Radio Centro 93.9FM, in the emblematic Plaza Mexico in Lynwood, CA., where he alternated with great figures of Mexican regional music. The promotion of the single “La Verdad” starts “on the right foot” and, apart from being on several radio stations in Central and South America, it also sounds on radio stations in Mexico, the Pacific and western Mexico in cities such as: Guadalajara , Puerto Vallarta, Culiacan, Tepic, Los Mochis, Ixtlan del Río, Colima and Ocotlán, in the Radiorama chain. Very soon, potentially, it will do so in the same way: Radio Centro, Radio Fórmula, ACIR Group, among others, of national coverage. 5 million views and, with the launch of the theme: “THE TRUTH”, theme of his own authorship, it is expected to increase that amount in a good amount. … the great human being, … EDUARDO ALEJANDRO.